Episode 2’s last part was a lot of foreshadowing for an explosion of violence punctuated with mobile suit combat in space. Episode 3 is that explosion, with very little character-to-character time away from mobile suits. This reflects a transition as the plot thickens, with nothing resolved, but with a lot of beautifully animated action. Frankly, there’s no point in a long review. You cannot legitimately watch this episode without having seen eps 1 and 2; there is absolutely no hand-holding and you are plunged directly into the action (which I find somewhat refreshing). Having watched eps 1 and 2, you know that there’s a big picture plot afoot, the main character has some connection to it, but he doesn’t understand what that is. He is a pawn in a larger game, trying to do the right thing in a world that does not support such a principled, neutral choice. And so, he is drawn into more and more conflict, and makes a mistake he cannot take back. That should have a familiar ring to it. Even so, a fair viewer can’t exactly blame him. He is trying to navigate an impossible situation where there is no right or wrong clearly announced by the proper road signs, and either way, people are going to die. However, I can unreservedly praise the quality of the action, the outstanding animation, and the pure thought and attention to detail that went into all this. The moral ambiguity is not preachy, and is a lot more “real” than most of what we get to see in the franchise, and more to the point, we are given a gripping experience that does nothing to detract from the future plot. 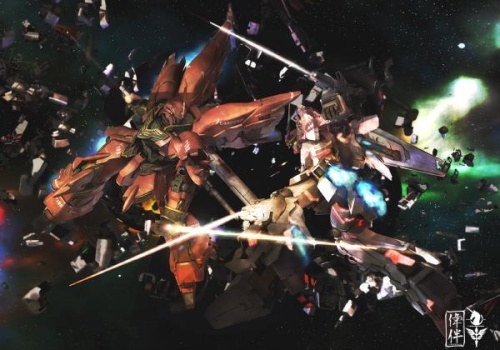 This entry was posted in Art, Gundam, Japan and tagged anime, Gundam, Japan, review, unicorn. Bookmark the permalink.